Just like its bigger C7 sibling, the Galaxy C5 is essentially a mid-range offer. That being said, we don't expect anything mind-blowing in terms of pure number-crunching power. What we are looking for, however, is enough "omph" to power through the list of everyday tasks most users will likely require. Seeing how even the sub $150 category now typically has the breathing room of an eight-core chip, it should come as no surprise that the Galaxy C5 runs smoothly. 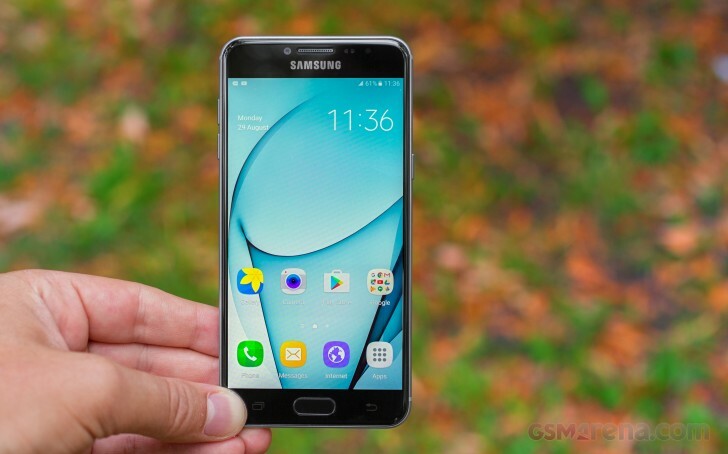 Its 4GB of RAM also allow it to punch well above its Galaxy A5 (2016) counterpart it terms of multitasking. Coming back to the benchmarks themselves, the Galaxy C5 can definitely hold its own against competitors. When we picked the competitions, we put the emphasis on both display size and the price range. The ongoing surge of increasingly better and more tantalizing offers out of China has landed some quite interesting phones on the chart. Handsets like the Xiaomi Mi 5, Meizu Pro 6 or the Huawei Honor 8 definitely punch a whole league above the Galaxy C5 in terms of performance, while still remaining below the $350 mark. Still, the problems with most of these usually lie in availability or after-sales support, so there is a trade-off to consider. First, we're looking at some all-round benchmarks, like AnTuTu, and we can clearly see the Galaxy C7's Snapdragon 625 is not only more efficient, but also quite a bit more powerful thanks to its higher clock rates. As for the rest of the Samsung devices we picked up for the chart, the Galaxy J5 (2016) is expectedly lacking behind the C5 with its Snapdragon 410 and 2GB of RAM. That is naturally true about the Galaxy A5 as well, rocking the older Snapdragon 615. Although, the distance is smaller in this particular race. The Galaxy J7 (2016) on the other hand is providing some solid competition across the board. Just like we originally thought, Samsung's own Exynos 7870 Octa is pulling strong in most benchmarking aspects and not only tops the Snapdragon 617 in terms of power efficiency, but also in raw power in many of the tests. It is very hard to definitively point out the superior device in the pair, especially when you throw in the Adreno 405 versus Mali-T830MP2 battle. Don't get us wrong, we are far from the idea that the J7 (2016) is a superior device overall, but Samsung might have been better off betting on its own 14nm Exynos 7870 Octa in the C5. The purely CPU-oriented GeekBench clearly shows that the Galaxy J7 (2016) benefits from having all eight of its Cortex-A53 cores maxing out at 1.6GHz. This is a just one of the perks of using a superior chip fabrication process. And sure, the performance boost isn't mind-blowing in real-life scenarios, but synthetics, especially with multi-threaded loads show a significant difference. The very same logic applies to the Galaxy C7 with its 2.0 GHz cap as well. Moving on to graphics, the Adreno 405 bundled with the Snapdragon 617 provides adequate graphics performance. It will easily power through most every casual game in the Google Play Store. As for the aforementioned comparison to the Mali-T830MP2 inside the Galaxy J7 (2016), well, it's a mixed bag. We will let you decide for yourself, but will note that since the latter has a 720p display at its disposal, only the off-screen tests offer an equal measuring basis. Also, the J7 (2016) didn't manage to run the most intensive OpenGL ES 3.1 Car benchmark. But, then again, running it a 2.6 frames is hardly an achievement for the Snapdragon 617 in real-life terms either. But still, it's commendable that the Adreno GPU even supports OpenGL ES 3.1. Finally, there is Basemark X, which should provide a better overview of where the Galaxy C5 stands graphics performance-wise among its competitors. All things considered, the Samsung Galaxy C5 may not have the top-tier specs to impress, but it won't let down even power users. Of course, don't expect quite the same impressive punch its bigger C7 sibling delivers with peek clocks in the high 2.0 GHz range. But other than that, you still get the benefit of 4GB of RAM, so you can multitask to your heart's content. The sole fact that Samsung feels confident enough to include its full-featured multi-window working environment on to the handset is plenty of proof that the C5 won't leave you hanging whatever the situation.